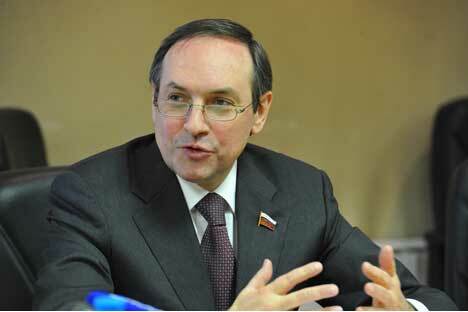 Vyacheslav Nikonov is Russian Duma deputy. Source: PhotoXpress. One of the four priorities put forth by Russia for this year’s APEC agenda is food security. What interests and goals is it trying to promote? Before the 1917 revolution Russia was a net grain exporter to Europe. In the second half of the 20th century, it became an importer, and at the start of the 21st century, we started exporting again. Asia was never viewed as a potential market because for much of that history it had a poor population. Nowadays the eight largest APEC countries by population import 100 million tons of grain annually. That’s more than Russia produces. We can’t miss this opportunity to get our niche and attract technology from neighbouring countries. What are the barriers preventing Russia from exporting grain to Asian markets? First, the port infrastructure isn’t there. While there are ports capable of handling that kind of cargo in the West of Russia (e.g. Novorossiysk, Tagaron, etc. ), there are none in the East. Second, we don’t have the transportation in place to get it to port, either. The Trans-Siberian railway can’t handle that amount of cargo, nor can the existing roads. This makes costs very high, even for grain coming from Siberia. These prices keep growing. Finally, in order to be cost-efficient, cargo needs to move both ways along the Trans-Siberian. Right now grain is coming from European Russia to Asia and empty wagons are going in the other direction. Therefore the price increases further. There was talk of attracting foreign labour and technology to improve farming in Russia’s Far East. At what stage are these plans? At a very preliminary one. The Far East has potential to develop agriculture, but it will never replace the Volga Region or the North Caucasus (even though those two regions are currently experiencing difficult weather conditions). There are no major obstacles preventing the Far East from becoming agriculturally self-sufficient. However, if we’re talking about exporting grain to Asia, this is a possibility in the future. After all, Russia was the world’s second largest grain exporter last year. APEC countries account for about 37-38 percent of all imports worldwide. Our percentage of that is currently zero. Agriculture is developing in the Fast East. Investment is flowing in, and foreigners already work on our farms. You may have heard of North Korean labour in Siberia and the Far East. Plans to develop the port infrastructure I mentioned earlier have also been developed. Should this plan succeed, which Asian markets would be the first to import Russian grain? The ones with the highest populations buy the most grain– China, Japan, South Korea, Vietnam, Thailand and the Philippines.